Looking for a peaceful and private vacation destination? Here is the answer! Enjoy the privacy and comfort of your own vacation property, ONE BLOCK OFF THE BEACH, only a short walk to Marco's South Beach entrance. The property features a soaring cathedral ceiling in the great room, three bedrooms, two bathrooms, custom tile flooring throughout entire house, a screened-in private heated pool and lanai with a propane grill, central air, and all amenities to make your stay comfortable and relaxing including high speed wifi internet. This house very roomy, 1,750 sq. feet under air and in immaculate condition. We have just completed a significant interior renovation including new kitchen with stainless steel appliances and granite counter tops, new tile flooring throughout living area, new moldings, new 60' plasma TV, etc. The hall bath was renovated in a refreshing coastal theme. We also installed a new air conditioner and pool heater in 2016. The pool area faces west, providing maximum sun exposure. You are welcome to use all of our pool toys and beach chairs for the beach. Full-size washer and dryer, two-car garage with four bicycles (two adult, two child), DVD, Sony Playstation 2 with 14 game titles, and other puzzles and games for kids. The master bedroom is furnished with a queen-size bed, private bathroom, flat screen cable TV, and sliders going out to the pool area. The master suite was just freshly painted in 2016. Bedroom Two is equipped with a queen-size bed and flat screen cable TV. Bedroom Three is equipped with two twin beds, flat screen cable TV, and sliders going out to the pool. The house also has a crib and high chair for those families with small children. All linens, pillows, comforters, and towels are provided - as well as a fully-equipped kitchen. Located on the south end of Marco Island, this property is one block off the beach and more importantly a short walk to two of the three public beach accesses on Marco! Many properties advertise their proximity to the beach, but it is of little benefit without beach access. Additionally, you are a short walk to shops, movies, restaurants, and other activities in the hotel district. This is truly perfectly located on the island. 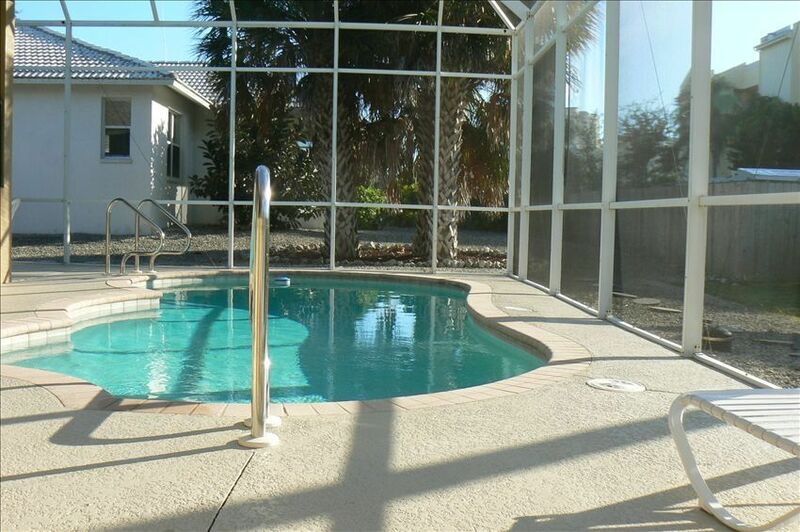 As full-time residents of Marco Island, we are able to care for this home and personally oversee every aspect to make sure your vacation stay is carefree and relaxing! We are always updating and refreshing the house to keep it feeling like a home in which you would be happy to live. If you have any questions or needs while at our home, call us and we will be there. The Marco/Naples area offers everything from picturesque and challenging golf courses, both backwater and Gulf fishing, boating, jet skiing, parasailing, Everglades escapes, snorkeling, and dining experiences to match all tastes. Marco offers excellent shelling, Gulf swimming, and beautiful sunsets. We have been enjoying Marco Island for over 20 years and were able to move to the island full time a couple years ago. We manage the home ourselves and are available to answer questions, provide recommendations or handle any issues during your visit. We enjoy walking the beach every morning and returning after lunch for lazy afternoons. Jet skiing the gulf and 10,000 islands is one of our favorite Marco activities. We've had many great memories at our Marco home and invite you to create some of your own! Just a terrific, well cared for house. 7 or 8 minute walk to beach access path in either direction. First time to Marco and we would definitely do it again. Thank you Brian & Lisa. Our family loved our stay! Thank you for letting us stay at your beautiful home! The pictures on HomeAway do not do it justice. We had wonderful family time relaxing by the pool and in the large living room. We enjoyed cooking in the large kitchen, going for bike rides, playing board games and walking to the beach looking for shells. We even took out a boat with friends that were stayin in the area and visited some of the islands. We were able to see lots of dolphins up close! We would highly recommend your home! I'm so happy to hear you enjoyed Marco Island and my home. I'd love to hear from you again sometime. We stayed for 2 weeks in October 2016. The house is spacious, nicely decorated and has a good flow with masterbedroom to the left and the two other bedrooms to the right of the livingroom/kitchen area, which gave us some privacy. We had our 2 grandchildren with us and their parents. The pool was used a lot (understatement of the year), we all liked it very much. Coming from Sweden we wanted to be outdoors as much as possible. We had all our meals on the patio which seated only 4. Brian came over with an additional two (big) chairs and it got fairly cramped. The pool area and indoor dining table had also only 4 chairs. There were some other issues that was fixed by Brian & Lisa. We walked to the beach daily (15 mins) and the beach trolley was very handy to have. Bikes and beach towels were provided. We ran out of gas (outdoor grill) which we had to refill ourselves, I was a bit surprised but all in all we had a very nice and pleasant stay. Thank you so much for positive comments! We are glad that you and your family enjoyed your US vacation at our home. It is always good to meet people from other countries! We pride ourselves on our customer satisfaction and were happy to be right there to respond to your needs at our home. I am confused by your comment about the kitchen seating. As shown in our pictures on this website, the table is 6 ft long and has six seats which we just purchased new in May 2016. Additionally, we have two extra chairs at the game table and four stools at the kitchen island. I wish you would have said something to me when we came over to bring you the extra chairs you requested for outside. We are so happy that you enjoyed our home and the proximity to the beach. We hope that you will come back when you make to this country again! We visited Brian's and Lisa's house during the summer of 2016. At first, I want to say that we have been coming to Marco Island for the past 18 years and always stayed in the condominium(s). In 2016, our kids decided that they wanted to stay at a house with a private pool. Therefore, we booked Brian's residence through VRBO. Since it was our first time using VRBO, we did not know what to expect. During the booking process, Brian was very helpful and was able to answer all of our questions. We LOVE the house. It's located very close to the beach and it's remodeled. The hous is well equipped to include the bicycles. We never had any issues and our security deposit was returned back to us within 30 days. For the two weeks that we stayed in Brian's house, we were able to explore Marco Island and visited places outside of the island. We went to Key's, Naples and Clearwater to name few. All places were located close to the island/Brian's residence. Would we come back to Brian's house? YES, however, we were lucky to purchase our own residence on Marco (our retirement place). Everytime that we drive past the house, we have great memories of our 2016 family vacation. Highly recommended!!! Thanks! I'm glad you enjoyed our house and congratulations on the purchase of your own Marco home! Great Trip. Fabulous weather. House has great location w/i 2 blocks of the South Beach and numerous restaurants. Can walk just about everywhere. House was very clean and spacious, with a nice pool. Owner has house equipped with everything you'll need. Try the crab cakes from the Wednesday morning farmers market-awesome. Thanks, I hope to have you again next year and the crab cakes are awesome! restaurants and other activities in the Hotel district. This is truly perfectly located on the Island.